My last post talked about why we shouldn’t overdo it on the party planning. But purchasing everything pre-assembled can get pricey, so here are a few cute things I did to save money & personalize it a little for my Munchkin. I was so busy having fun that I didn’t meticulously take pictures of my handiwork, but I think that’s a good thing (except when I’m trying to explain to other people what I did). For starters, this is the party theme I bought. However, rather than buying everything to fit the theme, I saved money by only buying the swirly hanging decorations (see below), tablecloths, invitations, & dessert plates. For everything else–flatware, napkins, dinner plates, & even a couple extra tablecloths–I bought cheaper, solid-color items in the party’s colors: light blue, purple, & hot pink. I also got balloons in those colors. The Munchkin was insistent that the kids all wear party hats, so we got assorted solid-color ones at Party City that happened to match the theme colors really well, then decorated them with sea animal stickers together. She loved helping! In previous years I would’ve been too much of a perfectionist to let her help. Now for my favorite part: the favor buckets. I bought these sandcastle buckets from Party City for 99 cents (my advice: sign up for their emails before you order; I started getting all sorts of discount offers after I’d placed my order!). They come in 8 different colors, so I’m sure they’d match your theme colors. Then I filled them with awesome cheap sea-life-themed favors from Oriental Trading Company. I hate the buckets that are full of useless crap, so I tried to choose things the kids would actually like to use. 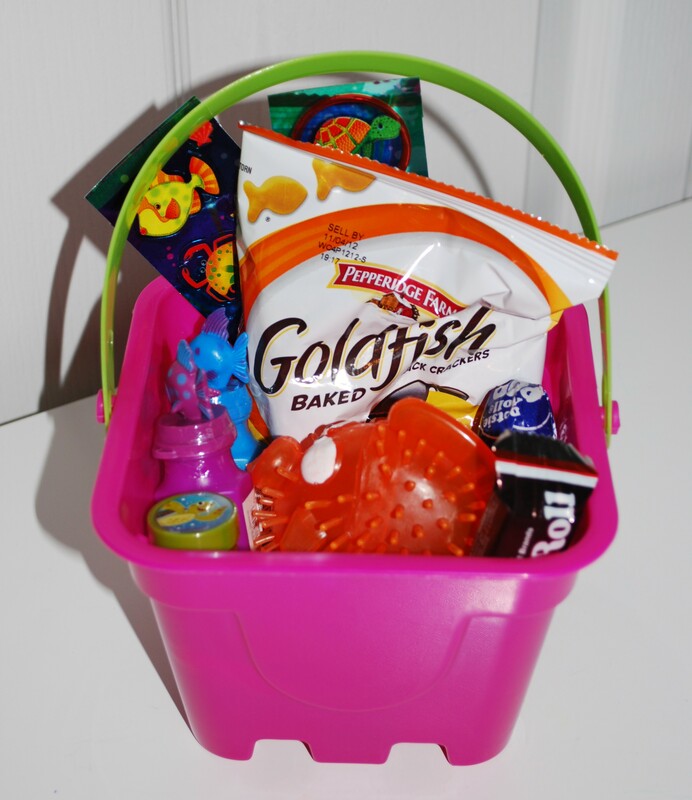 The Munchkin loves bubbles, stickers (those were from Party City & also delightfully cheap; we bought extra to decorate the hats with), & stampers, so we included those & a squirty fish thing, then a bag of Goldfish & just a few pieces of candy. To assemble them, we grouped like items together & formed an assembly line; it taught The Munchkin to follow patterns! These buckets would be great for any ocean-type theme. They received lots of compliments, & they were simple & inexpensive! Next, the thank-you notes that came with the party supplies were the fill-in-the-blank kind. Those are great for kids who are learning to write, but The Munchkin’s still young enough that I’m doing the writing for her. So fill-in-the-blank would be kind of a copout. Instead, I bought blank notecards from Target (again, they come in lots of cute colors) & puffy stickers from Michael’s (can you tell I like stickers?). 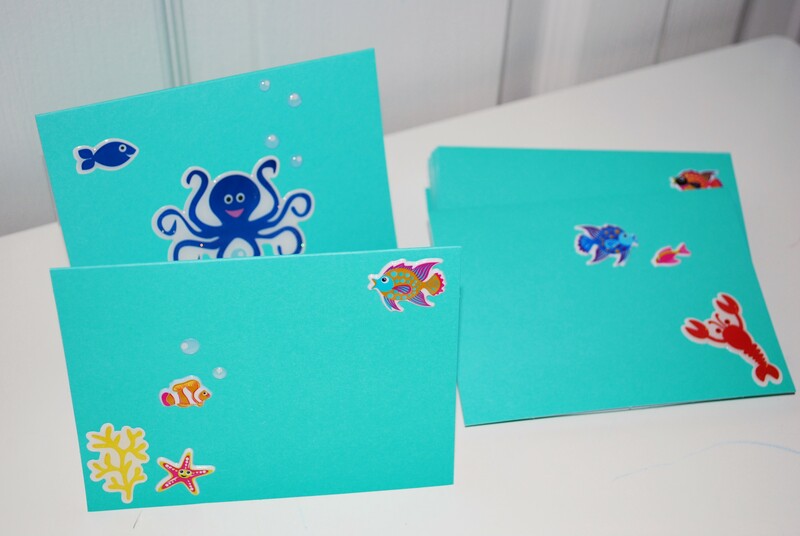 The Munchkin & I decorated the cards in little sea life scenes. You could do this with any theme imaginable & it’d look great! Last but not least, activities. One of the great perks of having the party at the splash park was I didn’t have to coordinate activities. But with Tropical Storm Debby threatening, I came up with a couple last-minute things to keep the kids busy under the pavilion in case we had a momentary downpour. I printed an Ariel coloring page & a couple of sea animal coloring pages & had a bucket of crayons. Then we let the kids make jellyfish. To prep, just cut cheap white paper plates in half & have streamers & a stapler handy. The kids color their jellyfish, & then you tear off some streamers & staple them to the straight side. So easy! So there you go! Hope this helps with the planning of any ocean-themed parties in the future. Just remember to listen to your own Munchkin rather than what the professionals on Pinterest think, & keep it simple: if you overdo it this year, you’ll just have to try to outdo yourself next year! The Munchkin’s Best Birthday Yet. 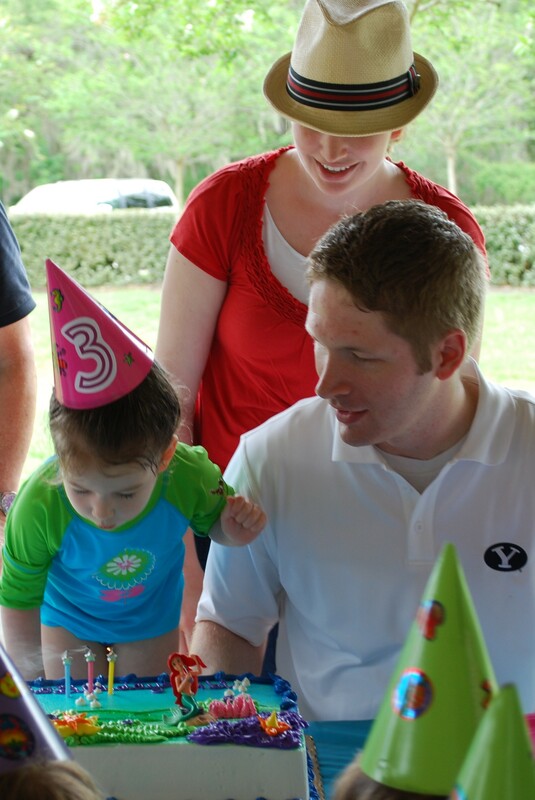 I have a confession to make: I didn’t make a single thing for this birthday party. Way back in February The Munchkin told me she wanted a mermaid party. “Not a ‘Little Mermaid’ party, a mermaid party.” I love this girl! She makes up her mind & sticks to it. With all this prep time, I had grand designs for customized printable invitations, themed food, etc., but the reality of a newborn, & family in town for said newborn’s baby blessing (isn’t she cute? 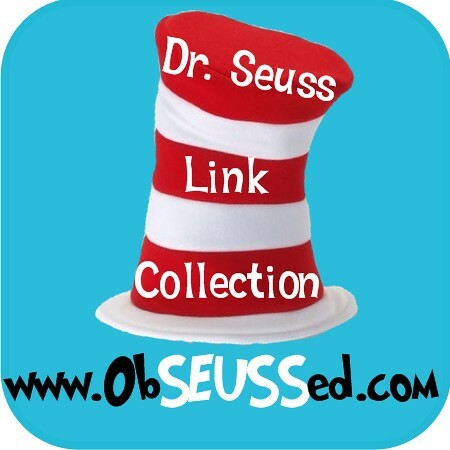 ), set in really quickly. 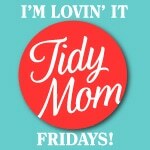 Still, it took awhile to get past the mom guilt brought on by picture-perfect Pinterest parties. Do I love my child less because I bought my (still cute) decorations from Oriental Trading Company, hand-wrote fill-in-the-blank invitations, & ordered a — gasp! — supermarket cake? Absolutely not! I realized that in past years I had poured so much of myself into these events that, not only was I so stressed out I was stressing everyone else out, but I was seeking validation from other people instead of my Munchkin. This year my only pre-party panic moment was about whether we should pay a hefty deposit to move the outdoor party inside because of Tropical Storm Debby. 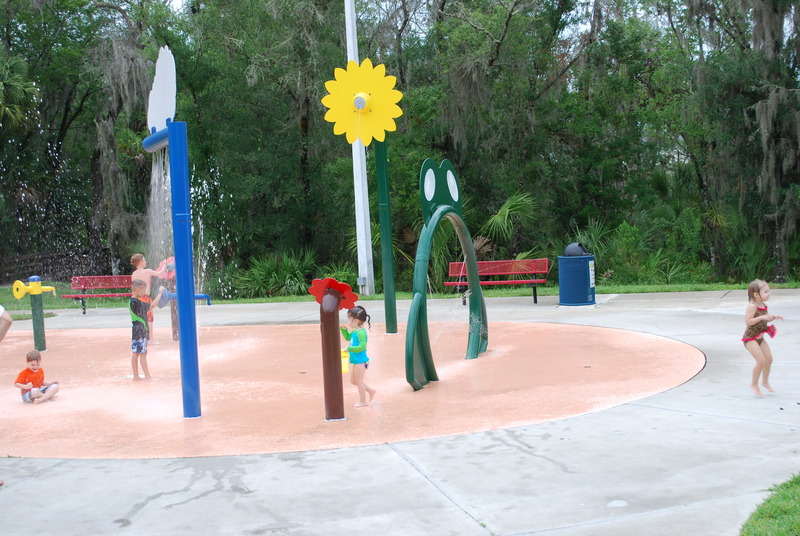 Thanks to a lot of prayer (& even, in a weak moment, an email to the FOX 13 morning meteorologist), we kept the party at the splash park just like she wanted, & we all got to actually enjoy it. So I’m writing this to let my fellow “just moms” out there that you don’t need to order custom everything from Etsy or specialty bake shops or whatever. You don’t need to impress the grownups there. 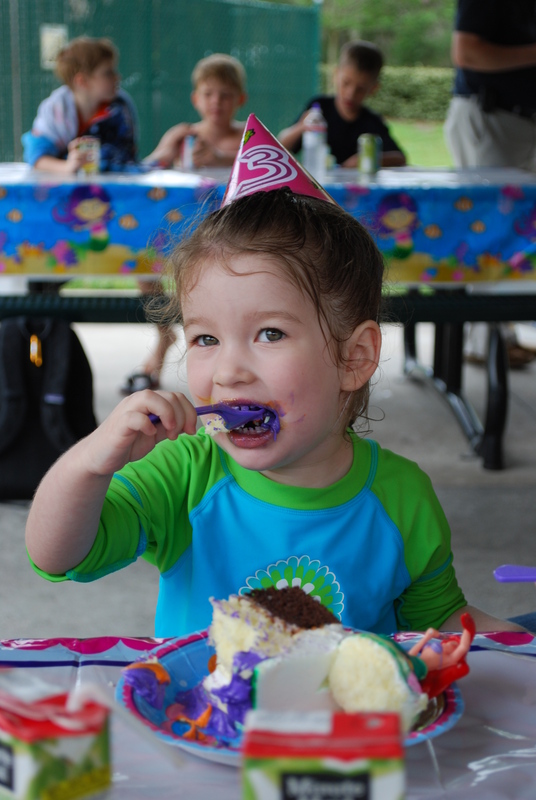 Sometimes a splash park, a Publix cake, & some party hats with stickers on them are all you need to make a birthday girl’s day. To minimize mess, I generally buy & cook the short pastas, so when I told The Munchkin we were having “slurpy spaghetti” for dinner, she practically leaped for joy. 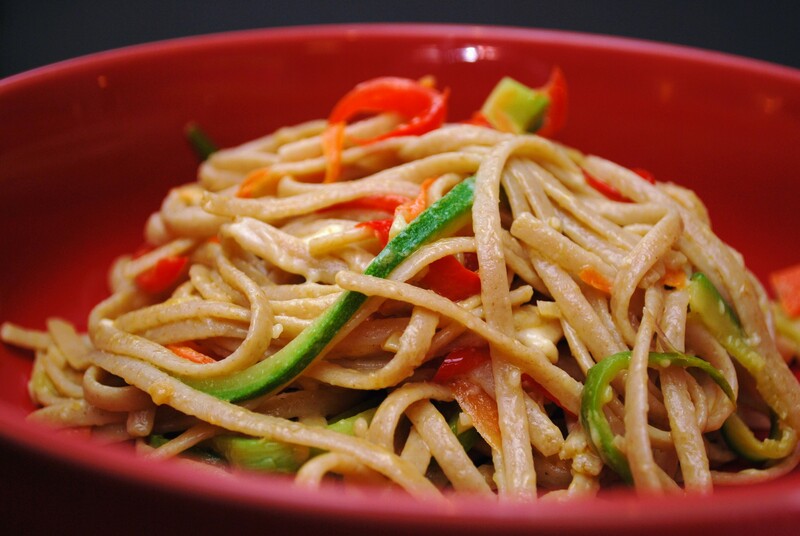 The many different veggies in this dish are julienned just like the pasta, so she slurped them up just like the noodles. & get this: she was happy about it! She ate them on purpose! “Look, mommy, I’m slurping asparagus!” This, coming from the toddler who enjoys carrots, but will hardly touch zucchini or asparagus. The bowl was polished off. Success! Julienne your vegetables with a knife or the shredding blade of a food processor. Meanwhile, heat oil in a saute pan over medium heat. Add veggies & salt & saute an additional 3-4 minutes or until softened. Drain pasta, reserving 1/3 cup of the pasta water. Return pasta to pot or place in a large serving bowl. Add veggies, pasta water, butter, & Parmesan; toss to coat. Let your Munchkins pretend to be baby birds slurping up worms! 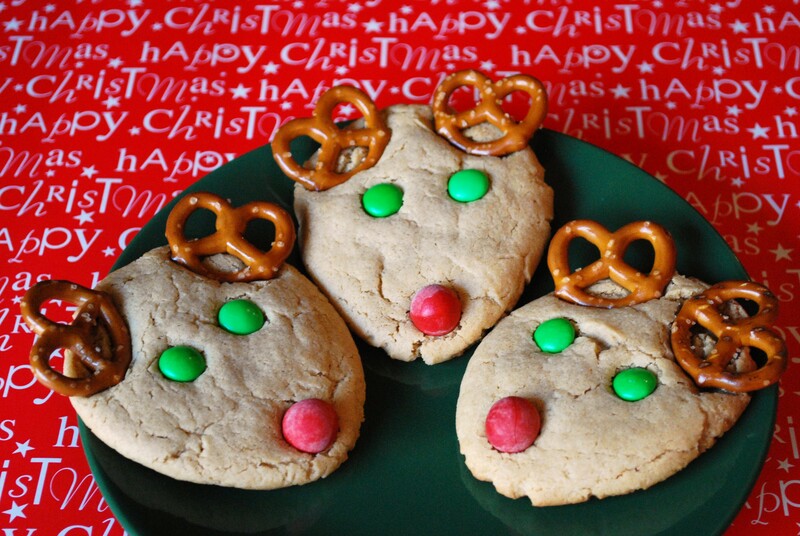 The Munchkin has been looking forward to making these for DAYS. & they turned out just as great as we hoped they would! 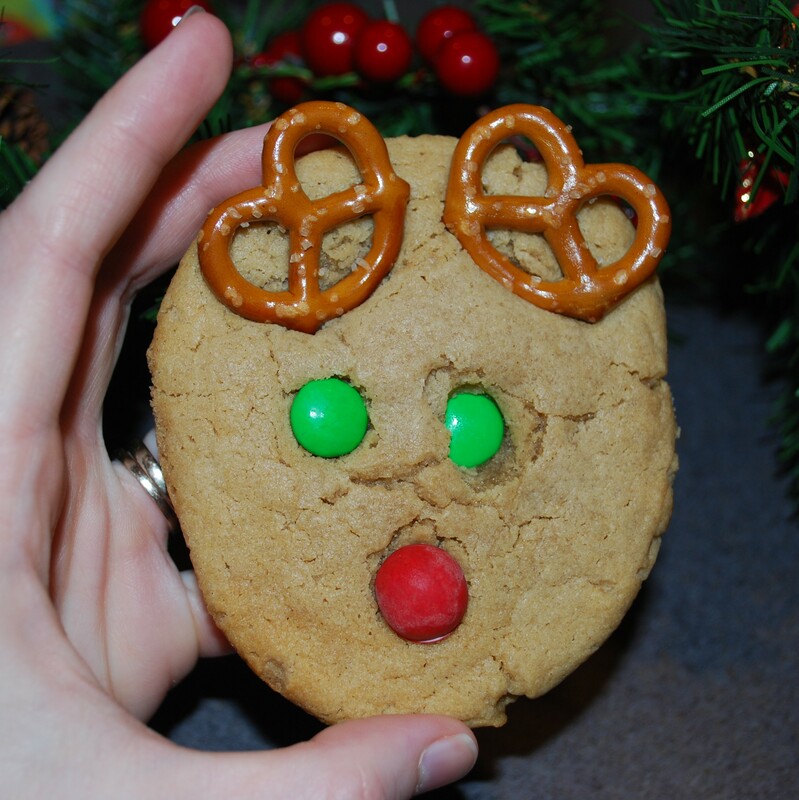 I had originally thought to do spice cookies, but The Munchkin said peanut butter, so that’s what we did! 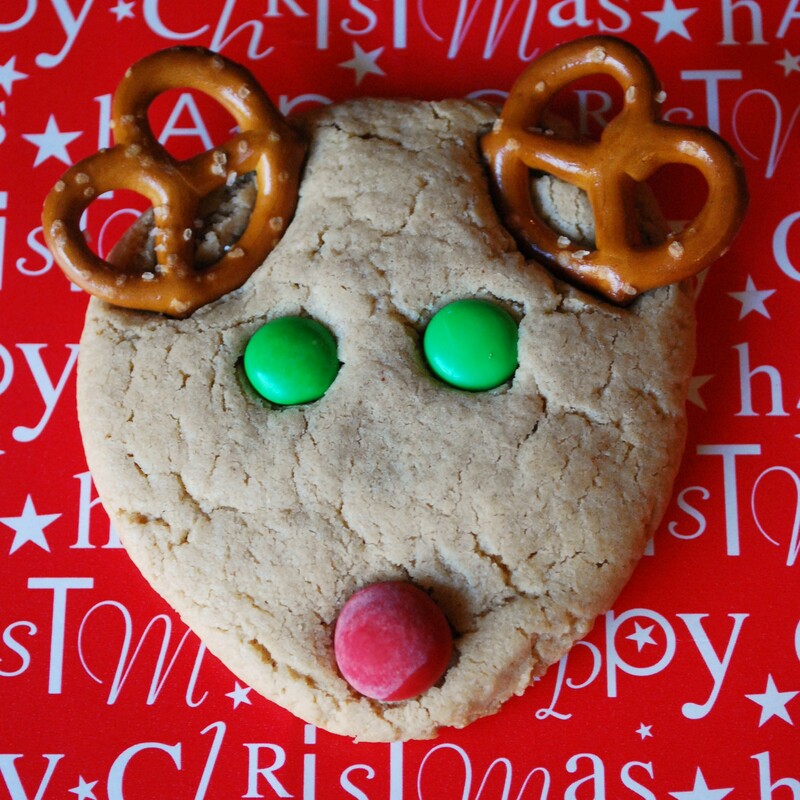 Lucky for us, Bakergirl had already made delicious peanut butter reindeer cookies! Hers are for mini reindeer, but I had full-sized “features,” so I made them full-sized. It yielded 18 cookies instead of 40. 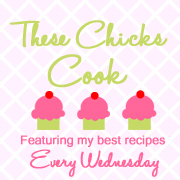 Preheat your oven to 375. Line a baking sheet with parchment. Cream together first 5 ingredients in your electric mixer. Add egg & beat until just blended. (Optional: combine dry ingredients in a separate bowl.) Add to the wet ingredients & mix until just incorporated. Roll into 2-inch balls. Pinch one end between your thumb & forefinger for the “chin.” Then flatten between your palms. 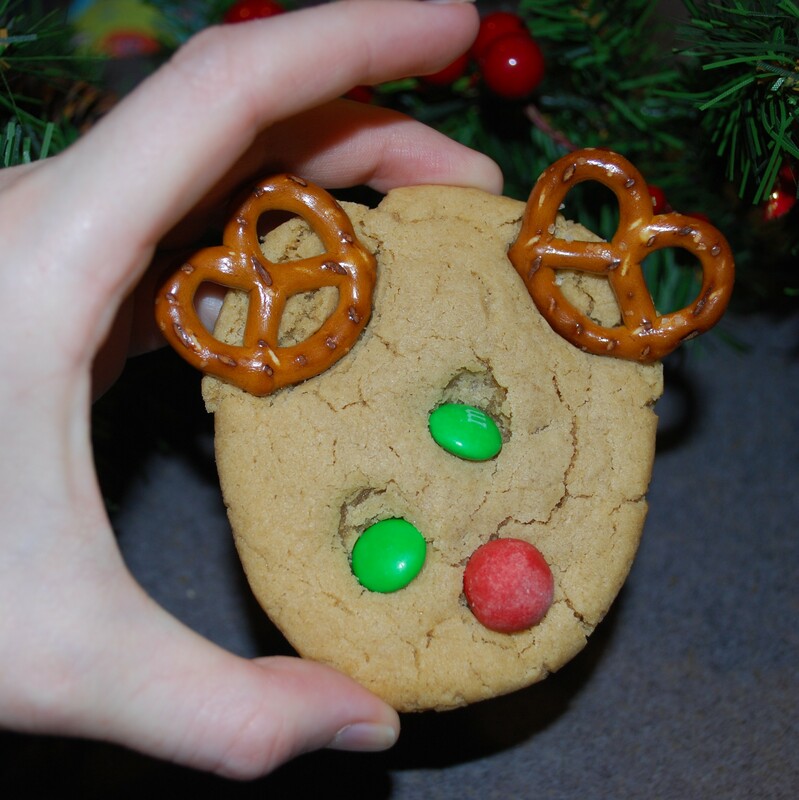 Place them on your prepared cookie sheet; I fit 9 on a sheet to keep them from spreading. Bake 9 minutes or until set in the middle & just starting to brown. Let your kitchen helper help you press in M&Ms for eyes (M side down, of course) & a Cadbury Mini Egg for a nose. I was amazed at how good The Munchkin got at decorating these! But by her 6th one, everything was in its proper place! 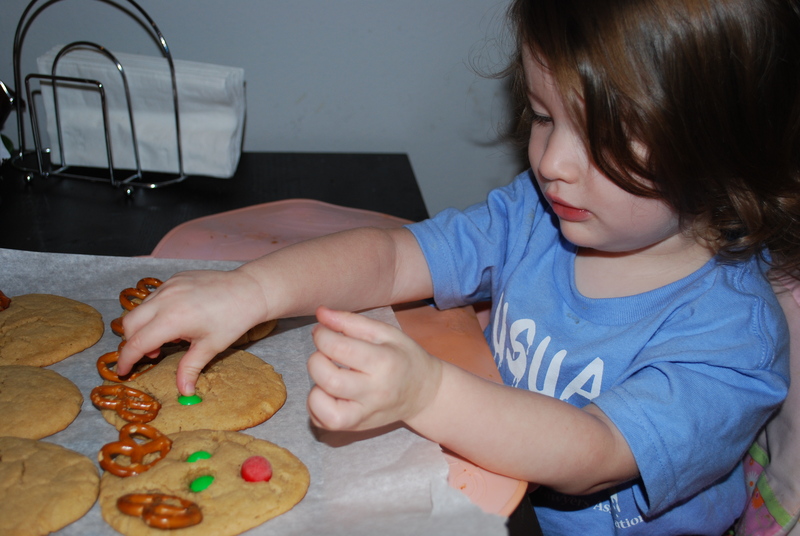 Who knew that cookie decorating could teach a two-&-a-half-year-old anatomy? Today I’m taking care of a sick Munchkin. But I’ll be back Wednesday having (hopefully) conquered my irrational fear of pie! I hope you enjoy the holiday with your own ghouls & goblins! What are your plans for the evening? We’re going to make some delicious Witch Hat Calzones for dinner & take our little Angelina Ballerina out for some early trick-or-treating! The Munchkin speaks very well for being 2 & a few months. She’s doing full sentences, & pronounces most words correctly, with the exception of the toddler W for Ls & most Rs. 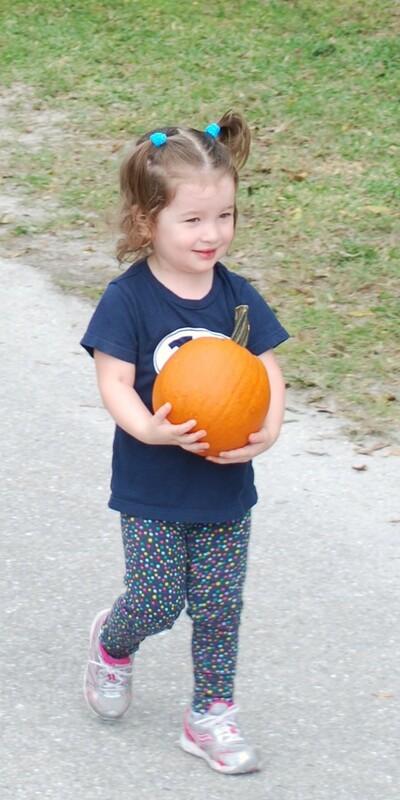 However, there’s one word in particular that she doesn’t say right, that I am just fine with her mispronouncing for the next month or two: pumpkin. She pronounces it “pumpmick.” & it is so darn cute! 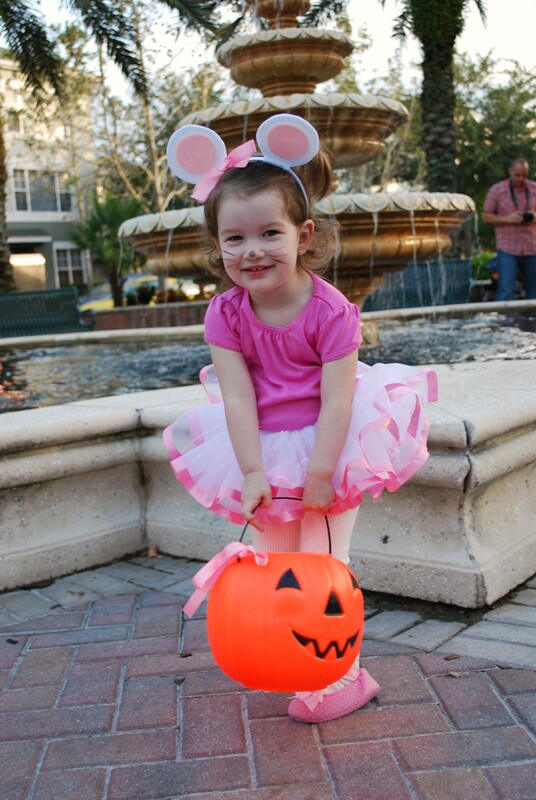 Thankfully, it’s still “pumpmick.” & she got her very own Munchkin-sized pumpmick at the pumpmick patch. 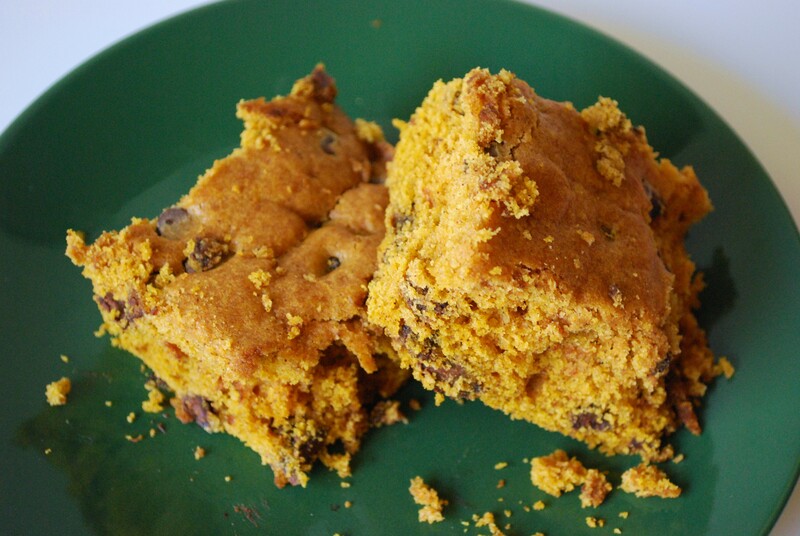 Now for some pumpmick — I mean, pumpkin — squares. These are to die for. Period. I make these countless times every fall — it helps that the recipe uses exactly half a small can of pumpkin, so you just have to use up the rest, right? I mean, just look at all those moist, delicious crumbs! Martha really does it right. Preheat oven to 350. Line a 9×13 pan with foil, making sure that the foil goes up the sides. Combine the dry ingredients in a medium bowl; set it aside. Cream butter & sugar together until it’s smooth. Then beat in the egg & vanilla; scrape sides of bowl. Beat in pumpkin puree, making sure there’s no unincorporated butter mixture at the bottom. Mix in dry ingredients on low just until combined. Then fold in the chocolate chips. Spread the mixture evenly in the bottom of the pan. Bake 35 to 40 minutes or until a toothpick comes out with just a few of those moist delicious crumbs I mentioned. Cool completely in the pan. (Yeah, right. You smell it & resist.) Use the foil edges to lift the bars from the pan, then peel off the foil & cut with a serrated knife. Enjoy!